Researchers at the University of Tokyo have managed to teach a quadcopter some impressive new tricks that vastly expand its capabilities past flying. 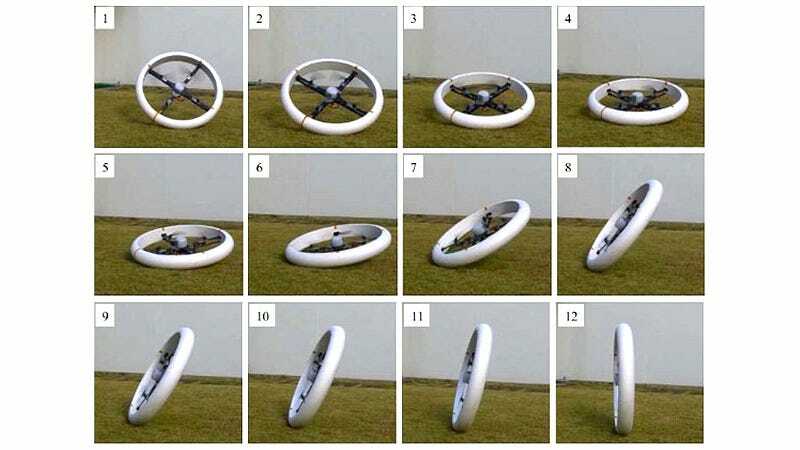 Their Multi-ﬁeld Universal Wheel for Air-land Vehicle—or MUWA for short—features variable pitch propellers so the thrust can be directed in opposite directions, allowing it to balance on edge like an autonomous bike wheel. But the balancing act isn't just a nifty party trick. Rolling along the ground requires less energy which expands the quadcopter's range, and being able to roll vertically allows MUWA to squeeze through spaces it simply couldn't in a horizontal flying orientation. The craft can also perform a neat maneuver dubbled 'tornado motion' by the researchers where it stands vertically and slowly spins on one spot. But instead of generating a devastating cyclone, the motion allows its onboard Kinect sensor to map out the interior of a space in 3D, making MUWA a wonderful tool for collecting reconnaissance data.